Toward the end of a pregnancy, many parents-to-be who had no major research questions suddenly have a big one: whether or not to agree to a C-section. 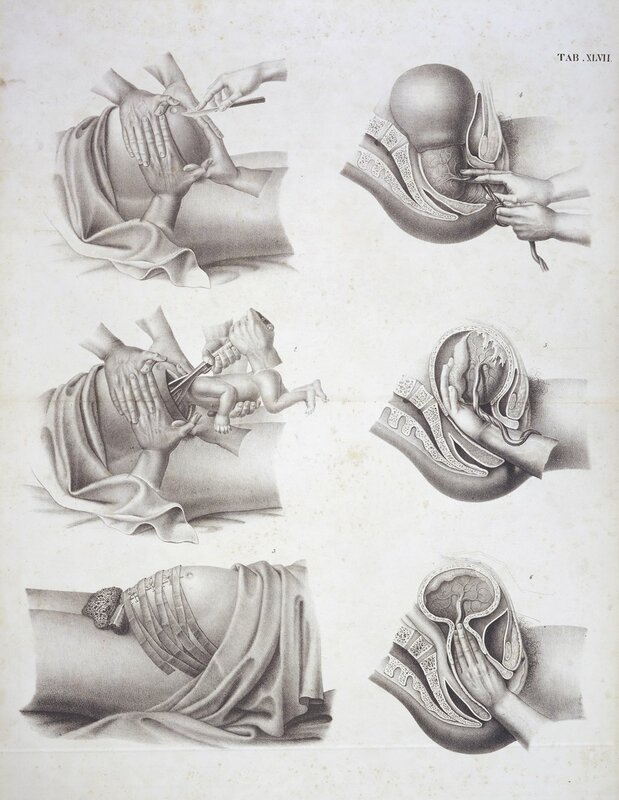 We think of cesarean sections as emergency decisions, and in some cases, they are. Obstetricians may decide to operate if the mother’s or the baby’s life is at immediate risk. But many of the thirty-something percent of pregnancies resulting in cesarean delivery are urgent non-emergencies. Pregnant women may be admitted to the hospital for many different pregnancy complications that don’t immediately threaten life, which may mean days of waiting and watching in the hospital before making a decision about a cesarean delivery. When it comes time to making big decisions about your delivery, you’ll be required to give your informed consent, meaning that your care team has described the recommended procedure and the risks and benefits of that procedure, and that they are confident you understand everything they just said. This is ludicrous, of course, because you more likely than not do not have years of medical training, and even if you do have years of medical training, if obstetrics is not your specialty you still won’t have enough time to learn the ins and outs of a particular intervention before you have to say yes or no to it. You’re offered the choice between induced labor or a cesarean section, and want to determine what choice is best for mom and baby. You know you want credible medical information to guide your decision, but aren’t sure how to find that information. Here’s four tips to help you find what you need. I don’t care what your high school or college writing teachers may have had to say on the subject. When you’re facing a big medical decision, start with Wikipedia. Don’t believe me? Go ahead and do a Google Scholar search for low amniotic fluid and look at the top results. You might notice that they’re not very recent—in my search, they were 2002, 1989, 1971, and 1986. If you’re pregnant in 2018, it’s likely that three out of four of these studies predate you. Here’s where things went wrong with that above search strategy: you weren’t searching for oligohydramnios, either because your medical team didn’t use that term or because you couldn’t get the spelling before they left the room. You were much more likely to have heard the term “low amniotic fluid.” Searching Wikipedia for low amniotic fluid will help you find the right medical term to use when searching in Google Scholar. Armed with the right search term, you go to Google Scholar and type in oligohydramnios, or one of several misspellings that will redirect you to oligohydramnios. Soon you’ll notice a new problem: Even if the information is accurate, it may not be what you need. If you’re in Week 37, you don’t want or need information on oligohydramnios during the first trimester. Reading that first-trimester information might needlessly panic you, as the condition is considered much more serious in the first trimester than in the third trimester, when fluid loss is more common. Before typing random searches, figure out what question you’re asking. Are you open to either mode of delivery, and wishing to find which is considered safest for baby or for mom? Are you completely opposed to a C-section, but want confirmation that waiting to induce is relatively low-risk? Are you opposed to being hospitalized at all and want to know your risk levels? Knowing your question can help you with your search. You want to know which delivery option is safest for mom and baby. So you do a Google Scholar search for “oligohydramnios induction cesarean.” You click on the first article, “Isolated oligohydramnios in term pregnancy as an indication for induction of labor,” because that seems appropriate to your situation, and after reading that piece feel confident that you should be in the hospital at all, let alone considering early induction or cesarean. The lesson here is it’s hard to use Google Scholar if you don’t already have a good sense for the academic field you’re reading about. Your care team likely ruled out “isolated” oligohydramnios before you were admitted (the fact that it wasn’t isolated is likely why you were admitted). Google Scholar isn’t the right tool for the job, because you can’t get a broad overview of a particular medical problem by reading even a couple of articles. What you actually need now is a literature review. This isn’t a thumbs-up, five-stars kind of review. Rather, it’s a specialized kind of meta-research (that is, research about research) The writers of a literature review collect all the available scientific literature on a topic, then analyze that literature and draw conclusions from it. One good source for medical literature reviews is Cochrane. If you had started your search for oligohydramnios there, you would have found a review of early delivery versus expectant management. The “plain language summary” at the bottom of the review of concludes that, based on the relatively small amount of data available, there is no major differences in outcome between induction and cesarean, and not enough data to determine how expectant management (that is, waiting it out) is better or worse than early delivery. Because you still have a little time to wait, it might interest you to know that Julius Cesar, for whom the cesarean section is thought to be named, probably wasn’t delivered that way. The evidence, Atul Gawande, says, is with his mother Aurelia, who survived his birth. If hemorrhaging hadn’t killed her, sepsis likely would have. Gawande’s article, which discusses forceps deliveries (a family secret for centuries! ), cesarean sections, Apgar scores, and the field of obstetrics more generally, is a great read.